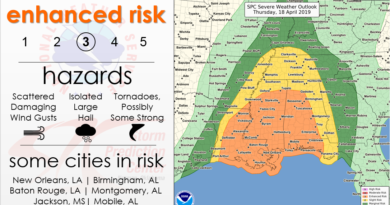 Spring time in the South brings the risk of Severe Weather seemly on a weekly basis. People sometimes get complacent because we see these events forecast so often during this time of the year. Often times these events do not always pan out and produce severe weather in many areas and this causes people to let their guard down. 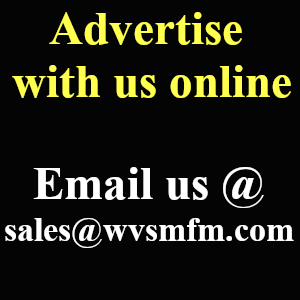 We all need to remain vigilant and take each forecasted severe weather event seriously. As we all have seen in the past, a watch may be the only advance warning you get. So, what exactly do I mean by that? Severe weather has to start somewhere. A Tornado has to start somewhere. There may not be a Warning in place at the very moment a storm drops a Tornado in your community. If a Tornado Watch or Severe Thunderstorm Watch is issued for your area, take it seriously and plan for action then. Because this Watch means conditions are favorable in your area to produce severe weather. 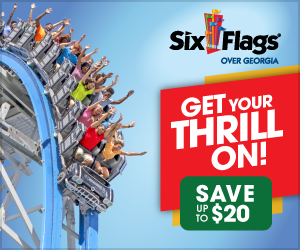 Now, turning to the weekend. 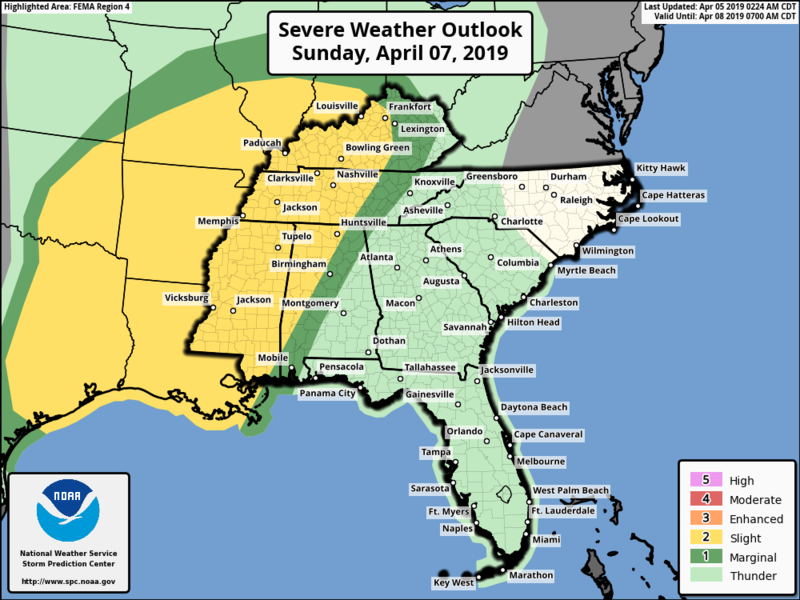 According to The Storm Prediction Center there will be a risk of Severe Weather on Sunday, April 7, 2019 across the South. 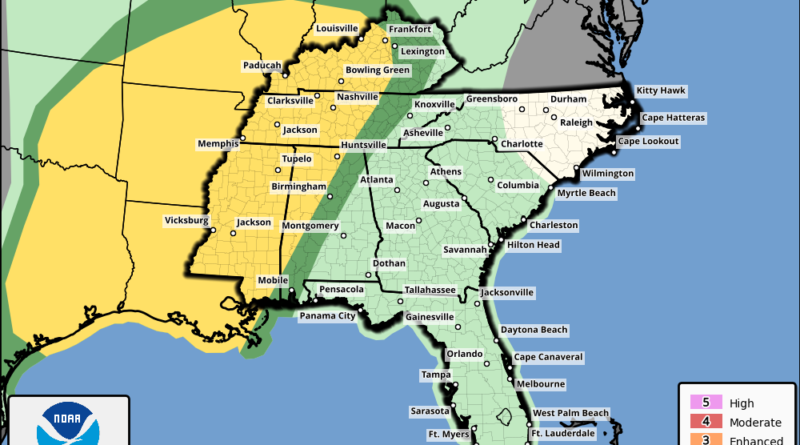 Severe storms are possible Sunday from a portion of the Southern Plains through the lower and middle Mississippi Valleys into the Tennessee and Ohio Valleys. Pockets of destabilization and diabatic heating will be possible over portions of the warm sector (the severe weather outlook area) where vertical wind profiles will support storm organization. It is likely that additional storms will develop within the warm sector during the day as well as along the cold front/dryline farther west across a portion of TX and OK. Activity will spread east and northeast during the period. While vertical wind profiles with 35-45 kt effective bulk shear should promote some organized storms, mixed storm modes are likely including the potential for clusters, lines and some supercell structures. Given the considerable uncertainty regarding impact of potential early convection along with mesoscale model differences, will introduce a broad slight risk area this outlook and refine in later updates as mesoscale details become more evident. Be sure to follow our Facebook page as we keep you updated on the Severe Weather potential for Sunday.